Those are so totally cute!!! Would be perfect for a halloween party! Those ghosts are so stinkin cute! 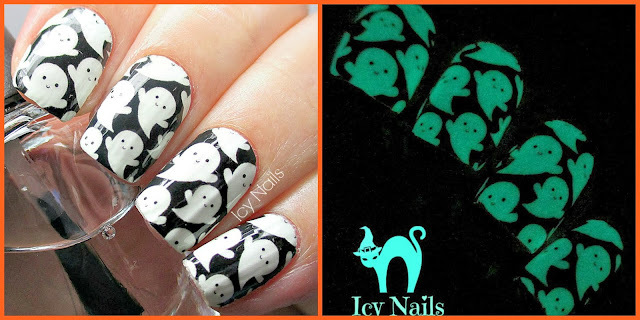 Those are very cute and cool nail applique's. I love how they glow in the dark. My daughter would love them. These are totally cute! I've never tried Incoco Nail Polish appliques before but I'm really tempted to get these or the glittery pumpkin ones. Those are super cute! Incoco products are amazing. Love 'em! this is such a cute nail wrap. I need to get my hands on them. These are just TOO CUTE. And they glow in the dark?! LOVE!! They are cute, aren't they? I love the glow in the dark. I am like a five year old with these things. I keep flooding them with light and walking into dark rooms to enjoy the glow.